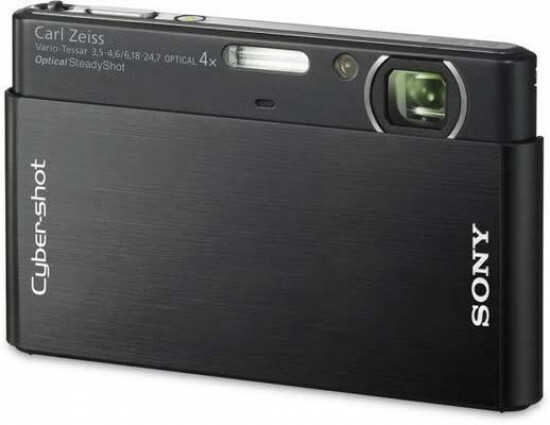 Listed below are some of the rivals of the Sony Cyber-Shot DSC-T77. The new Casio EX-FC100 is the fastest digital camera in town, capable of taking 30 six megapixel images in just a single second. The diminutive, well-built EXFC100 has a wealth of high-speed modes, including pre-recording images before you've even pressed the shutter button, and combining images to help eliminate camera shake in low light conditions. Video is also one of the Casio EX FC100's strong points, with 720p HD footage and 1000fps, super-slow-motion movies on offer. This 9 megapixel model is also a very capable still camera, with a 2.7 inch LCD screen and 5x optical zoom lens. With an official list price of $399.99 / £349.99, the Casio EX-FC100 is an expensive point and shoot - read our in-depth review with sample images, videos and more to find out if it makes the grade. The Nikon Coolpix S60 is one of the more distinctive compact digital cameras around, with a "wave-surface" design and large 3.5 inch LCD display. Furthermore, the S60 is almost completely controlled via its touch-screen LCD, even including zooming in and out. Other standout features of the Nikon S60 include a 5x zoom lens with Vibration Reduction, Scene Auto Selector for beginners, Smile Timer with blink detection, and and a HDMi output for viewing photos on a HDTV set. The Nikon Coolpix S60 costs around €349 / £299.99 / $349.95. The Sony Cyber-shot DSC-T500 is a stylish digital camera with a large touch-screen LCD and HD movie recording. The 10 megapixel Sony T500 also features a Carl Zeiss Vario-Tessar lens with 5x optical zoom and optical image stabiliser. Video is recorded at 1280x720 pixels at 30fps in the MPEG4 AVC/H.264 format. Available in black, silver and red for £289 / $399, Gavin Stoker discovers if the Sony Cyber-shot T500 offers as much substance as style.